Date of publication: July 29 2015 . 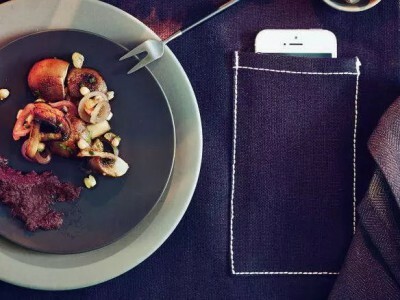 IKEA has been presented a new development, which is a tablecloth with pocket for Mobile phones. The Swedish manufacturer will publish this new product in a new directory. The idea simple: users will put their smartphones in a special pocket. Designers have gone to such ideas as have realized that without modern Gadgets not able to do almost no one in particular, mobile phones have always at hand. And in order to not interfere with a smartphone such as a family dinner, it can be hidden in a special compartment in the tablecloth. It seems that it is next to, but not distracting look. It takes into account and this goal, the device must be protected from damage drink or a meal. And those who love vykladyt your photos on the social network InstagramCan easily get the phone and capture his meal. Neither the time nor the cost of new items while no information is provided. Recall a little earlier IKEA launched the sale of branded furniture with presence function wireless charging mobile gadgets. Also it published a series of covers, which can take advantage of iPhone lovers and the rest of the smartphone, which is not designed for wireless charging.